Every now and then I have the pleasure of shooting live broadcasts for the Fretboard Journal Magazine‘s website. Although the broadcasts are produced under less than ideal conditions (tiny room, minimal audio support, available lighting), I thoroughly enjoy being in the presence of so many world class musicians. 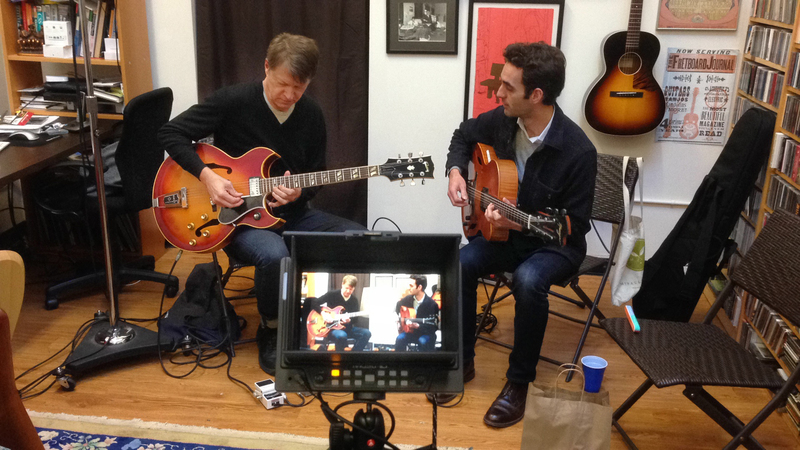 Nels Cline and Julian Lage prepare for a live broadcast performance and interview. 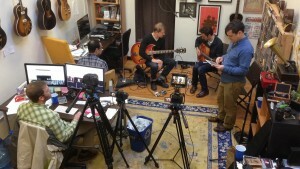 Past broadcasts I shot include Tommy Emmanuel & John Knowles, Rodney Crowell, Blake Mills, John Pizarelli & Bill Frisell, Milk Carton Kids, and most recently Nels Cline & Julian Lage. I have also shot video for Fretboard Journal at the Wintergrass Bluegrass Festival. Nels Cline & Julian Lage performing. I have been shooting and editing video for over 6 years in the Seattle, WA area. My experience includes corporate interviews and events, live music and dance performances, Kickstarter campaigns, short independent films, documentary films and more. Clients range from small businesses to larger companies such as Seattle Opera, Amazon, Group Health, Microsoft, Century Link, University of Washington, Lexus and Napster Music. I frequently work assignments for production companies as a work-for-hire camera man and location audio recordist. I can work as a crew of one, or scale up with additional crew to accommodate larger projects. I offer a full range of preproduction, production and post production services. Please take a few minutes to view some of my work, and keep me in mind for your current or future projects.